There really is no specific reason why I love matte polishes. Although, you don’t see me posting it up on my Nail Of The Week often, it’s because I only use single colors on my matte polish days and well, I wanna share this one, finally! 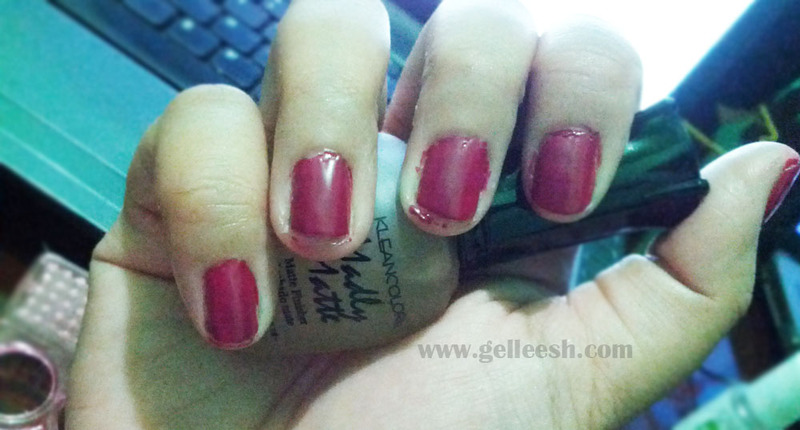 I’ve tried buying matte nail polishes from Etude House before but they’re such a drag to apply. They dry up so quickly before you can even put them nicely on your nails so they tend to look really crappy after application. Last Cosmetologie 2012, I bought the KleanColor Madly Matte Matte Finisher. I’ve heard about matte top coats and since I want matte on my nails, why not give this one a try, eh? 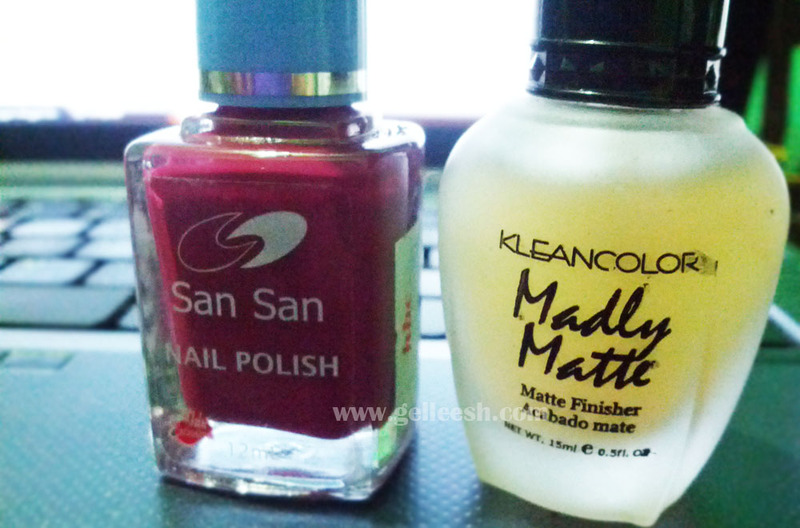 The KleanColor Matte Finisher has a transparent bottle and contains 15mL of product. I love the packaging especially the cap because it looks really elegant and classy. It looks expensive but it’s not! Honestly, I forgot how much exactly this is but it’s pretty affordable, as far as I can remember. You know me. I don’t buy overpriced stuff. So, how do you use the matte finisher, you ask? Well, for my nail of the week, I used two coats of the SanSan Nail Polish in Red Gleam and then just topped it off with the Klean Color Madly Matte Matte Finisher. No need for two coats of the matte finisher. It has a thick formulation, which can easily give your nails that matte finish you’d love to have. I love its matte texture and how cute matte looks on one’s nails. It has this youthful feeling in it. Are we on the same boat? So, have you tried matte on your nails? What are your thoughts? ohh pretty color!! perfect for fall! oxblood! loves it :)! No I haven't, actually this is the first time I heard there's a matte polish. :) But I think this is interesting to try on. Nice color, red hues are so elegante! Love the color and I think I need a matte finisher for I love matte nail colors. I'll def grab and try it out. I generally prefer matte polishes as well, not a sparkle person! to shoot you an e-mail. I've got some ideas for your blog you might be interested in hearing. Either way, great blog and I look forward to seeing it improve over time.